This comfortable salon invites people to lounge and listen to the ocean while wearing Shellphones, to tune into the pink noise pirate radio station, and to close their eyes to better hear the amplified sound of their own heart beat. Various other noise generators, pink food, and drink will enhance the rejuvenating effects of this Saturday afternoon salon. At 7pm neuro-scientist and founder of Inter Space, Tricia MacKenzie, PhD, will speak to the relevance of pink noise. Pink noise is known to have relaxing, meditative effects. It is notable for its occurrence in nature: it’s in the sound of a heart beat, rain hitting the pavement, and ocean waves. It can also be generated electronically—such as for the calibration of audio equipment—but it should not be confused with white noise. White noise is the noise of every frequency driven at maximum energy often associated with the harsh machine-like hiss of static. Pink noise, on the other hand, features an inverse relationship between frequency and volume, so that as the sound gets higher pitched it becomes quieter, and the same amount of noise power is distributed to each octave. It is called pink noise because light with the same power spectrum would appear pink. 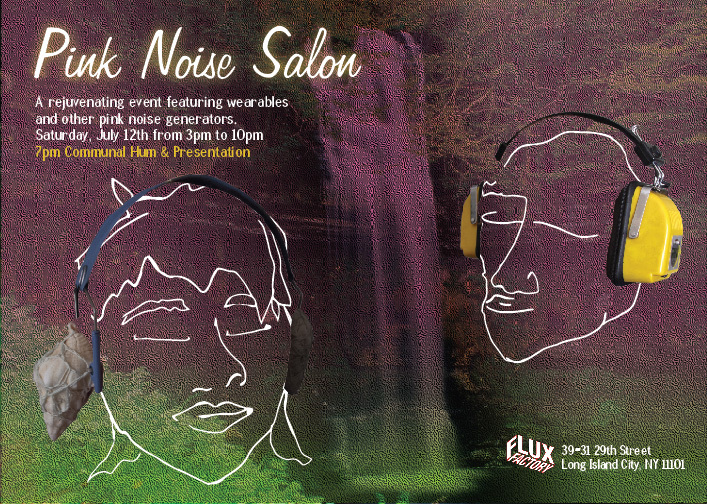 The Pink Noise Salon also investigates the value of pink noise as a means of filtering cultural over-stimulation. As the day comes to an end, we invite you to rejuvenate with pink noise, enjoy relaxing with others, and to join us following the 7pm talk in humming together. A project by Flux Artists-in-Residence Caitlin Foley and Misha Rabinovich in collaboration with Danny Crump, Jung In Jung, Will Owen, Julius Shmiedel, and Tricia MacKenzie. previous post: July Flux Thursday: July 10!